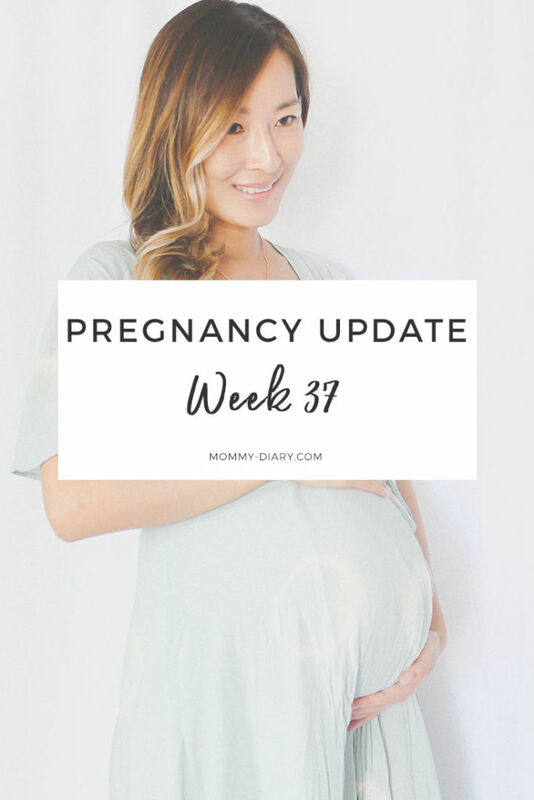 I can’t believe I’m already at week 37. This week I’m feeling more energized and better than I have in the last few weeks. I even had enough energy to take my kids to their afterschool activities AND go to the mall for a few hours which is rare nowadays! It’s certainly not comfortable and I’m still battling insomnia at nighttime but the sudden burst of energy allowed me to get out of the house more than usual this week. I still can’t walk around for too long due to sharp pains in my pelvic bone and legs but I really can’t complain knowing such discomforts are expected around this time. I’m currently 2 cm dilated and 50% effaced. Doctor says this doesn’t mean much in subsequent pregnancies and labor can happen any time from now until the end of the month. I swear, these final weeks are the longest weeks of my life! 1. Due date: August 1. 2. Weight Gain: I’ve gained 21 pounds since the beginning of pregnancy. I gained 40 lbs with first baby and 38 lbs with second, so this is the least I’ve gained thus far. I’m eating everything I want but not eating as much sweets. It must be the boy cravings. 😉 I’ve learned it’s best to maintain an active lifestyle and healthy eating habits even during pregnancy. I don’t control my appetite and eat whatever I want but eating less junk food definitely helped me to not gain all the unnecessary weight. Plus raising two kids keep me active and busy with little rest and naps in between. 3. Symptoms: I get sharp pains running down my legs when I walk and have lingering lower back and lower abdomen pains that lasts throughout the day. I’m also experiencing Braxton Hicks contractions that are painless but uncomfortable. The cramps are sometimes painful so I try to lay down on my left side whenever they come. As a mom of two, it’s luxury to be able to lay down when cramps occur, sometimes I just have to toughen it out. I’m also experiencing bad acid reflux and heartburn every time I eat. 4. Food Cravings: I’ve been eating a mix of healthy and not-so-healthy, from home cooked spaghetti, Korean bbq, chicken soup to Del Taco tacos and french fries. 6. Body changes + Physical activity: I have a sudden burst of energy this week which I’m very thankful for. The only exercise I’m getting these days is light walking around the neighborhood. 7. Belly shape: I’m carrying much lower this time and a recent ultrasound showed that the baby’s head is very low, which caused my belly to measure smaller than it should be. Luckily the baby is growing fine at 5.5 lbs (now almost 6) and everything looks good. I’m very thankful for this smooth pregnancy. 8. Emotions: I’m currently torn between “please come out so I can finally meet you” and “stay in there as long as you can so mommy can get some rest.” I’m still nervous about adding another child to our family of four. I have no doubt it’ll be a wonderful change, but I have absolutely no clue how it’s going to be and this uncertainty is killing me! I’m almost ready for this baby! I just need a few last minute final details like a diaper genie and few more newborn essentials like blankets. I survived 9 months of pregnancy with only one pair of J.crew maternity pants. The rest of the time I wore non-maternity dresses that can still accommodate my growing belly such as this wrap dress, strap maxi dresses, off the shoulder A-line dresses and bohemian ethnic dresses with plenty of room. I didn’t spend money on overpriced maternity dresses since I knew it wouldn’t last long and skipped pants with belly bands altogether because I just couldn’t stand them. Overall, I think I had most fun dressing the bump this time around. I can’t believe I’m only 3 weeks away from meeting my baby boy. It’s exciting and surreal all at the same time!